A few weeks ago I wrote about the situation at Catholic University of America. Legal action is being taken against CUA, ostensibly in the name of Muslim students. In that post, I said that the students were whining about the fact that CUA was simply being Catholic. After receiving this clarification, I now realize that I was being unfair to the students themselves, as they are not particpating in this action. The real whiner/snivveler is John Banzhaf, a law professor at George Washington University. For whatever reason, he has an axe to grind against Catholic University - and perhaps the Catholic Faith in general. At any rate, CUA's Tower shows some Muslim students repudiating Banzhaf's actions. One went so far as to say that she "would not want to be represented by a person like Banshaf". Banzhaf has made quite a name for himself, it seems, by flinging lawsuits about as a flower girl at a wedding tosses petals all over the floor. Why, according to his own website (such an impeccable source! ), he's one of the "100 most powerful people in Washington DC". He has filed suits against tabacco, has taken "fat" to court and is (be seated for this breathtaking revelation), the Father of Potty Parity! I'm sure that looks impressive on his resume! So dreaming up a bogus discrimination lawsuit is right up his ally - never mind that the "victims" that he "wants to protect" really don't want his "help". But too bad! If a progressive thinks you are a victim who cannot exist without his assistance, why, you're just too ignorant for your own good and you will be "represented in court" anyway! I hope there's a halfway intelligent judge in DC who can put this man in his place! Stuart Shephard has resumed production of his Stoplight series. Here's the first one after the hiatus. (Click here if you cannot see embedded video). An Abortionist Who Is Having A Sale! This is a new low in callousness and coarseness. Abortionist James Pendergraft of Florida is apparently trying to lure women into his Orlando center. Presumably they aren't meeting their murder quota. At any rate, here is the text of the "coupon" from their website. PRINT THIS PAGE AND BRING IT IN FOR $50 SAVINGS ONLY ON SUNDAYS! VALID FOR ABORTIONS PERFORMED BY 5/31/12. You must present this page to the receptionist at the time of the abortion ON SUNDAYS ONLY. $50 credit towards cost of abortion. No cash value. Notice that the coupon will be honored only on Sunday. Whatever else "keep holy the sabbath" means, it does not mean murdering one's own child that day - or any day for that matter. In a way, I can understand Pendergraft's need to raise some quick cash. He has to pay $36 million in damages after a botched abortion. However, given the botched abortion and the fact that his license was suspended four times earlier, I cannot imagine why he's allowed to practice medicine at all. Pendergraft does late-term abortions, as does Leroy Carhart in Gernamtown. Carhart does some of his bloody business on Sundays, too. I wonder if Carhart will start having "specials". Rumor Of Papal Call For World Central Bank - Quashed! Remember that rumored "Papal call for a world central bank"? Cooler heads have been trying to talk some sense into fevered progressive heads, but the latter just hear what they want to hear. Of course it was just a white-paper study from Pontifical Council for Justice and Peace. It carried no magiserial authority whatsoever. Comes now the news that Cardinal Bertone, the Vatican's Secretary of State, has forbidden all offices of the Curia from releasing anything without being reviewed and authorized by the Secretariat of State. He has repudicated that white paper. I for one am grateful that the overeager lemmings in the Vatican have had their leashes pulled in. Progressives, you can stop salivating now! A number of great articles came across my email today and I was going to post them. I see that my friend and colleague at Les Femmes beat me to the punch, so I'll just send you over there! One word about that second article. The author, Rey Flores, is the former Director of CCHD for the Archdiocese of Chicago. For having the courage to initiate some real reform of the local granting process, the local liberal cabal orchestrated a campaign to have him fired and to return the local CCHD to its mishandling of donation dollars. He does write from an insider's perspective and his insights are valuable. 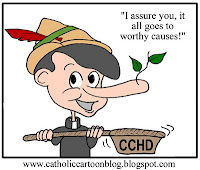 For additional information on the CCHD, visit the Catholic Media Coalition site (on right tool bar) and watch the Vortex's two CIA episodes dealing with the CCHD. Shame On The Bishops Of Mississippi! It was announced today that Mississippi Initiative 26 failed to pass in a general vote today. This measure would have amended the Mississippi Constitution to recognize personhood as beginning at the moment of fertilization. It failed by a rather narrow margin - 52% to 48%. In this New York Times article, we see that among its opponents are the "usual suspects" - NARAL, Planned Parenthood, the ACLU. That's so typical that it isn't worth the bother to comment. However, once again National Right to Life disappointed grass-roots pro-life activists. Sadly, it's no surprise and I learned long ago that National Right to Life is not to be taken seriously in terms of its political courage and resolve (or lack thereof). However, the Catholic bishops of Mississippi have abysmally disgraced themeselves and their high offices by opposing the Personhood Initiative. Yes! The bishops joined ranks with NARAL et al to oppose the measure and thus throw babies under the bus! It's not strategic, you see? Their fears of it hindering "efforts to overturn Roe" (Efforts!??! What efforts??!?!?!) are nothing more than lame excuses for cowardice (and I hope for nothing worse). Your Excellencies, if Initiative 26 would have been so harmful to the pro-life cause, don't you think the pro-aborts would have figured that out?? Instead of vociferously opposing the measure, they would have quietly let it pass - if what you said was true. As noted before, the initiative failed by a thin margin. Had the Mississippi bishops lent their support to this measure - or at least not opposed it - perhaps Initiative 26 would have passed. Lame excuses to the contrary, I believe they failed the babies miserably and will answer for that, should they not change course. The above is a sentence in Jill Stanek's blog describing the victory won by a dedicated group of pro-life Catholics in their parish. The parish in question is Our Lady of Fatima Church in Oak Park, Michigan. There they are misrepresented by U.S. Congressman Ed Rivet. Throughout his career (including an earlier stint as State Senator), he has voted to foster abortion and euthanasia. Last summer he headlined a Planned Parenthood fundraiser. So what did the "social justice" cabal at Our Lady of Fatima do? They invited Rivet to give a talk on "The Dignity of the Human Person". One might think that was a macabre joke, given his anti-life history. The announcement gave only one week's notice, but the faithful Catholics of that parish immediately sprung into action. They protested to both the pastor and to the Archdiocese of Detroit. At the same time, they mobilized various groups and made known that they would stage a protest of the event. Apparently, not wishing to face the music, the parish relented and canceled the appearance. Someone was paying attention and noticed what was about to happen, and they sounded the alarm. In your own churches, do you have a network of people willing to keep their eyes and ears open at all times? If not, form one! The faithful Catholics at that parish were prepared to drop what they had otherwise planned to take action. They were prepared to step out of their "comfort zones" and to get out into the streets, if necessary. Folks, street activism is necessary, and not just for a few of us; all of us (this means you) need to get off our duffs and on our feet and in the streets. In this case, the prospect of a public stink was enough to cause the pastor to see the errors of his ways. Had he not done so, it appears that the people were intent on following through. So must we be. If we're going to take back our Church and our culture from progressive lemmings, we need to have this sort of thing happen over and over again. That's how it's done! If you've been relying on the mainstream-lame-brain media, you've probably been spoon-fed nonsense about how this OWS thing is a spontaneous uprising of idealistic youngsters. Of course if you've done some independent research (which is most likely the case if you're reading this), then you'll realize OWS is really quite destructive. There are enough videos out there, videos created independently of the "New York Times / Washington Post" conglomerate. NARAL's "Chocolates For Choice" - Picketed! Although a small crew of us were there to speak words of righteousness and repentance to NARAL's shindig last night (that both served as blood-feast and fund-raiser), it was enough to hopefully prick a few consciences and to cause them to reconsider their hell-bent paths of life. Often, when consciences are pricked, anger is a first reaction. While we hope that this anger engenders subsequent reflection, that isn't always the case. Suffice it to say that consciences were pricked. We were also in downtown Rockville which is the seat of Montgomery County government - that is, we were in the heart of one of the top liberal lala lands in the US. The NARAL folks were a bit miffed that the exposed truth of what they're promoting might cause their chocolates to go sour. They called the police - the Rockville City Police in this case. Four officers showe up - one for each of us! One of the officers had this exchange with one of us. (Click here if you cannot see embedded video). Notice that the officers' main point is that "people don't like seeing the signs" (paraphrased, but listen for yourselves). Well, so what? Since when is exercise of First Amendment rights grounds for police action? Then he said that the folks attending the bloodfeast wanted to have a nice evening (again, paraphrased). That's laughable! A "nice evening" with chocolates paid with (at least in part) the blood money paid to murder babies! After claiming that some realty company actually owns Gibbs Street, they told us to cross Beall Avenue or get arrested. It turns out that was actually advantageous for our purposes, since most of the NARAL attendees were parking there anyway - and walking right by us. Even after we crossed the street, the cops stuck around. I suppose the City of Rockville is so crime-free that four officers can just lolly-gag around to keep those dangerous signs and pamphlets away from those who profit from the murder of babies. Perhaps that's the fault of their dispatch officer; at any rate, the City of Rockville just wasted tax dollars to soothe the consciences of NARAL. There's hope for the NARAL folks, though. If Bernard Nathanson, a founder of NARAL, can convert and devote the rest of his life to fighting abortion, then so can anyone of them. 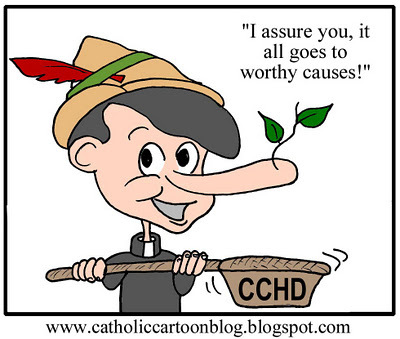 Vortex - "CCHD Should Demand Return Of Grants"
Some folks opine that Michael Voris' Vortex is a tad too hard-hitting: that he's too strident and blunt. Or, to use their politically-correct lexicon, he's "mean-spirited, unkind, uncharitable". In this particular episode, I'm of the opinion that he may actually be soft-pedalling the situation a bit. Donor Death "Not Required" For Organ Donation? That's what three authors of a paper submitted to the American Journal of Bioethics propose. See this Lifesite News report. It's been no secret that "live" donation has been going on for some time now, as organ integrity starts to wane soon after death. Basically they're saying "let's drop the pretenses. As long as the donors are beyond suffering (whatever that means) and their integrity is respected". 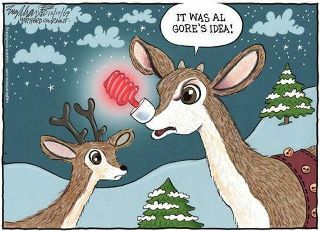 I believe they'd anesthesize the "donor" - how nice! They're that considerate - but when would that pretense fall by the wayside? And precisely how is the donor's "integrity respected" when the little Frankensteins only see him/her as an organ bank? The fact that these doctors (using the term loosely) can speak so brazenly of their disrespect for the lives of their organ sources with little outcry of indignation from the populace at large is chilling. I don't know what is worse: the murderous mindset of these "doctors" or the apathy of the citizenry at large. For years the Catholic Campaign for Human Development (CCHD) has awarded grants to organizations that work against Catholic teaching, particularly with regard to human life and marriage. Not only have donations from generous Catholics in the pew gone to groups that organize and lobby against Church teaching, but they have indirectly, and even directly, helped to elect liberal politicians who advance evil causes. In view of the recent devastating report from American Life League and ReformCCHDNow which indicates that the problems continue and have even worsened, the Catholic Media Coaltion endorses a boycott of the annual CCHD collection and urges Catholics to give instead to local organizations that serve the poor. Crisis pregnancy centers, Catholic free clinics and food pantries, Catholic shelters and homes for unwed mothers, organizations that serve the third world through clean water and immunization projects are all worthy alternatives to CCHD. 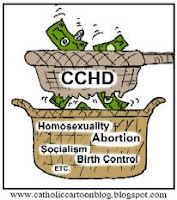 Despite their assurances to the contrary CCHD continues to funnel a large percentage of donations into community organizing groups and coalitions that are hostile to the faith and undermine the family. That is, certainly, no way to help the poor. Faithful Catholics of MD/DC, Inc adds its "amen" to that statement. Update: the CIA episode to which I linked in yesterday's post is now in youtube format, so here it is. Again, it's a long one, but only because it contains much worthwhile information. Click here if you cannot see embedded video. Real Catholic TV has released not only a video, posted below, but also has created one of their very informative "Catholic Investigative Agency" expose. The CIA doesn't appear to be in youtube format at this time, so you'll have to go to it here.